R.M.K. Trucking Service, Inc. - About us. RMK Trucking Service, Inc became incorporated in 1980, wholly owned by Robert M. Kennedy. At that time RMK consisted of only one truck and was contracted to Mayflower Van Lines to transport Household goods throughout the US and Canada. In the of latter part of 1981, after seeing the increased demand for high tech specialized transportation, RMK changed to transporting high value shipments consisting of art work, store fixtures, tradeshows and computers. 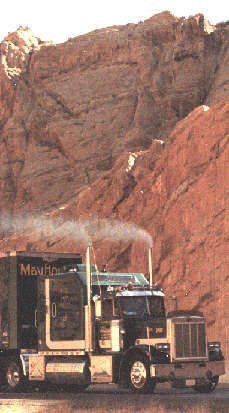 One truck soon grew to multiple trucks and by 1985, even though contracted to haul for Mayflower electronics division, RMK started to sell transportation. Specializing in pad wrap exhibits, RMK sold and transported many Fortune 500 companies exclusively. By doing the sales and actual hauling of the exhibit properties from start to finish, they could control 100% of the movement and guarantee a worry free, on time move. In many cases driver would stay on site to assist with Install and dismantling of equipment and exhibit properties. After spending 18 years in the trenches and witnessing the lack of communication, involvement and devotion offered by carriers, Robert decided that RMK could best serve the high value needs of the industry by exiting the hauling portion of the industry and concentrating 100% on the selling end. By being stationary in an office, he could better serve the customer by expediting quoting and by communicating all information and changes with each shipment and also monitoring each shipment while loading, in transit and delivering. After witnessing, on many occasions, customers that were trying desperately to contact carriers or carrier sales representative with problems or questions after 5:00 pm or on weekends. RMK chose to be available 7 days a week and 24 hours a day. To be able to offer all services to his customer, RMK soon signed on as an agent for Airways Freight Corp for air and international shipments, contracted to Whittier Mayflower for all high value shipments and transporting 3rd party through RMK Trucking Services Inc to offer high value, quality, on time service at a reduced price.